Newsies is fresh off Broadway and touring the U.S. This Disney stage musical tells the real-life story of New York City’s Newsboys Strike of 1899. 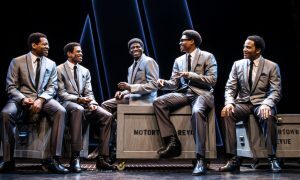 The production won two Tony Awards in 2012 for Best Choreography and Best Score and is absolutely full of song and dance. 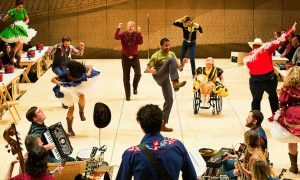 Dance Informa spoke with Ben Cook (playing Race) from the cast of the show. Ben celebrated his 17th birthday the day before our conversation, but don’t let his age fool you. He’s a seasoned Broadway performer who is clearly living his dreams. 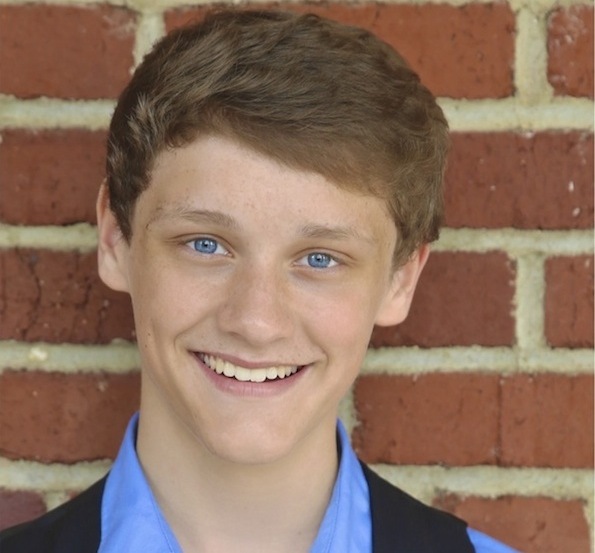 Ben shares a little about his background, how he manages being a youth performer and his favorite aspects of Newsies on tour. Do you have a favorite song or choreographic piece in the show? “My favorite song in the show is ‘The World Will Know’ because it’s when the kids go on strike. It’s such a powerful song and it’s very emotional in terms in of all of us banding together. It’s so great! In a choreographic sense, I personally love the finale and the curtain call of the show. Since we all have major dance backgrounds, we get to go off and do our strengths. We turn, leap and flip and get all our energy out at the end of the show. It’s so exciting. You get to see every individual person dance and do their strengths. 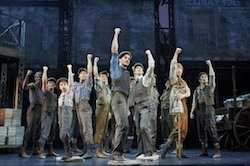 Ben Cook performs in the ‘Newsies’ strike scene to the left of Jack Kelly (center front) with the vest on. Photo by Deen van Meer, courtesy of Disney. Did you begin training as a triple threat or, rather, did you begin with a particular interest and diversify? You are 17 years old and have already experienced success in various venues. How do you balance the physical changes of a maturing physique with being cast as a character of a particular age? 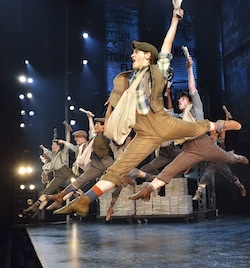 Ben Cook leaps in ‘Newsies.’ Photo by Deen van Meer, courtesy of Disney. This is the first tour of Newsies after its close from Broadway. What’s different about the touring show? “There are obviously a few little changes here and there. 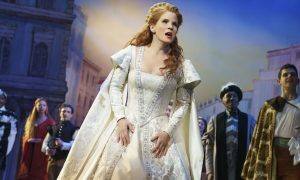 But, aside from very minor changes, this is the same production that was on Broadway. We are very lucky to have some incredible lighting designers and set designers who were able to make everything compatible for the road. We have a huge set – it’s about five thousand pounds! – and we’re lucky enough to have crews who assemble it on every travel day. It’s nine trucks! How do you keep up with your schoolwork while on the road? How much did you study the Newsboys Strike of 1899 in preparation for your role? Ben Cook (second from the left with a cigar in his mouth) does a toe touch with ‘Newsies’ cast. Photo by Deen van Meer, courtesy of Disney. What are some health and fitness tips you could share about performing in a touring show? What’s your favorite aspect of being on tour with this Newsies cast? Locate your closest tour venue for Newsies at www.newsiesthemusical.com. Fortunately, I got to see Ben the second time around, along with a Michael who was giving his last performance that night. I loved everything about Ben’s performance. Not just the dance numbers, but the way all of his movements in-between the bravura dance moves – the running, falling, jumping up of the chairs, etc. – flowed to the music without ever seeming like they were being done to counts of eight. It was the extraordinary performance I hoped (and expected) to see for that “second” hundred and thirty bucks. As an ex-performer, I have all the sympathy in the world for an actor or dancer who has outgrown a part or grown weary of it or is doing their not-quite-good-enough best. But as a paying customer who was looking forward to this particular show with an almost religious fervor, my sympathy was all for myself. I was in the third row, three seats in, so I got you close-up as you delivered the “See ya, Michael.” line using the other actor’s real name. (Sorry, I can’t remember what it was.) That bit has brought me close to tears every times I’ve read about it or heard it online – it’s such a moving bit of theater. I’m convinced you had tears in your eyes as you came down into the audience. And though I couldn’t and can’t know whether it was great acting or genuine emotion, I like to think it was real emotion, It was the cherry on the Sunday for me. I danced (mostly tap) from the time I was twelve years old, but despite having the love for it I never had the kind of talent (and work ethic) you and the other Billy Elliots have. The story of you kids doing Billy Elliot the Musical moves me far more than the story of the fictional Billy Elliot did. Thank you for a great night in the theater and for letting me see the Billy Elliot I was so hoping to see. May the rest of your career be filled with standing ovations. That you got to get them at fourteen just boggles this old man’s mind.